Former Sierra Leone international midfielder Mamadu Alphajor Bah has died after being involved in a road accident near Freetown on Wednesday. The 39-year-old, who made over 25 appearances for Sierra Leone, was driving when a truck coming from the opposite direction hit his car. Bah was later taken to hospital in Goderich, where doctors pronounced him dead as a result of excessive bleeding. He was buried on Thursday as police investigated the cause of the accident. Sierra Leone legend Mohamed Kallon, who was captain of Leone Stars when Bah was playing for the national team, said the death of the attacking midfielder is a great loss. "I am still in shock and deeply saddened by the loss of our friend, brother and father Mamadu Alphajor Bah," Kallon told BBC Sport. "He was an outstanding footballer, a great team-mate, very committed and hard working, always fun to be around. "It's a big loss and we'll surely miss him." "I'm shocked that my brother is gone. "It is like a dream. You're gone but you'll always have a special place in my heart. "He was a good player, brother and a family man. Rest in peace brother until we meet again." Current Leone Stars captain Umaru Bangura said: "I'm shocked and devastated. It's sad, this is a big loss for Sierra Leone football. May his soul rest in peace." Bah was one of the most talented players of his generation in Sierra Leone and was a key player for the national team between 2000 and 2008. At club level, he played in Belgium for KSC Lokoren from 1994-96 before he transferred to South Korea to play for Chunnam Dragons in 1997. 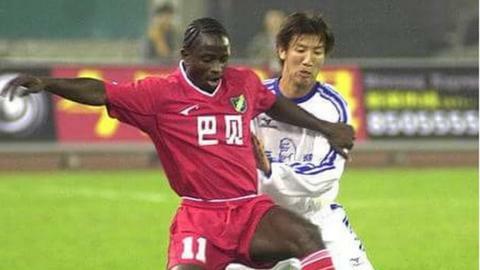 He moved to China two years later to become the first Sierra Leonean to play in the Chinese Super league, starring at Xiamen Lanshi from 1999-2003 and Zhejiang Lucheng in 2004. He later played briefly in Sweden for Halmstad BK.